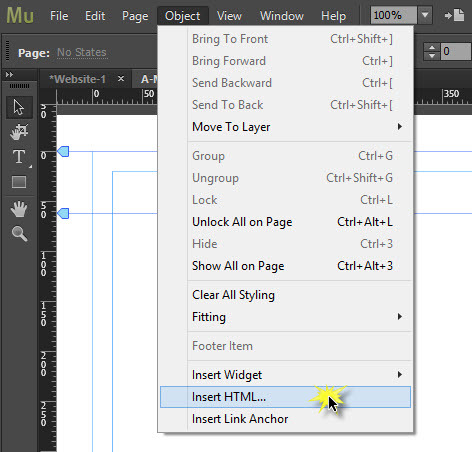 Adobe Muse, like many online website creation tools allows you to integrate your MetaLocator interface very easily. In this example, we will create a new website page then add the MetaLocator installation code into that page. This tutorial presumes your MetaLocator account is ready to go, meaning you have imported data and created an interface already. There are many other tutorials on this site that cover that process. While the website creation tools themselves may change over time as to how this might be accomplished, you will always simply be creating a page to contain the locator and using functionality to insert HTML to contain the MetaLocator code snippet. 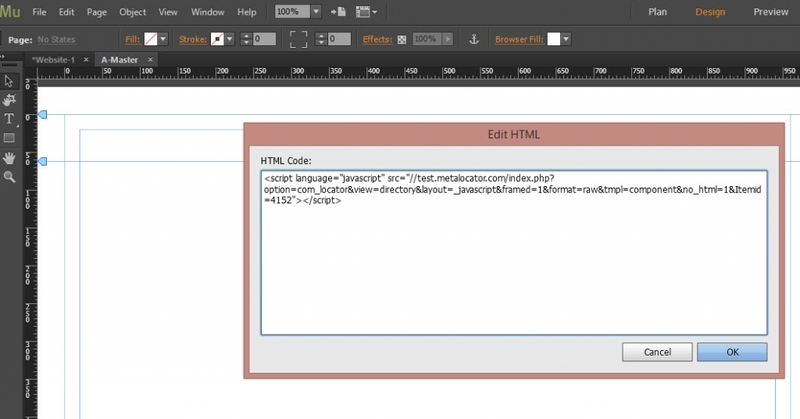 Regardless of the page editor used, the activity is the same - insert the MetaLocator installation code into the web page to integrate the locator functionality into your website. First, create a page then use the Object menu item and select "Insert HTML...". Then paste the MetaLocator code snippet into the box for HTML. The code can be obtained from the MetaLocator Dashboard, under Interfaces. Finalize the settings in your MetaLocator interface to customize the directory and map layout, sizes as well as styles and colors to match your site and page. Once the code snippet is in place you need not change it unless you create another interface to replace it. That's all there is to it!